Since the foundation on the house needed some (ok, a lot) of repairs we had to redo all the interior floors. 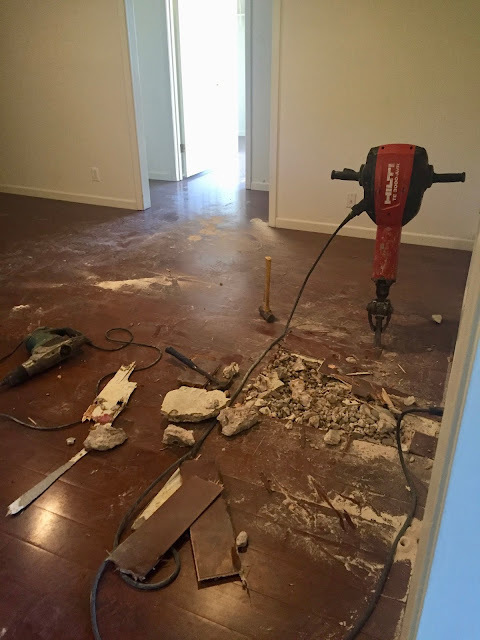 I was actually quite happy about the picking-new-floor process. Not so happy that we had to tear apart our home. I failed to take good before pictures before the floor demo started but here is one from the dining room. Jeff is standing on the dark hardwood floors in the living room. We closed on the house on a Friday and the foundation repair started on the Monday after. Nothing like a huge jackhammer sitting in the middle of our living room floor. The repair included drilling thirty-six 18 feet (5.5meters!) deep holes down into the ground. We actually lucked out and they hit rock about 12 feet down (3.7 meter) so we saved a little money and time (yay!). I couldn't believe how much dirt that they kept digging out from under the house. Who needs a couch when you can sit on a big pile of dirt? A grown man standing in one of the holes. Konrad was the supervisor. Konrad loved the messy part. He got to throw rocks! Now lets go and pick some new floors.